There are also a small number (at least twelve, by our count) of foresight certificate programs, ranging from five days to ten weeks in length. These, as well as standalone foresight courses, are ideal entry points for most professionals interested in foresight training. 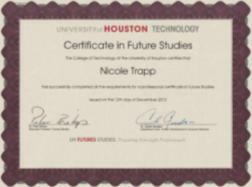 The University of Houston’s foresight graduate program offers a popular five-day certificate in strategic foresight. The European Business School, Swinburne U. of Technology, University of Manchester, and University of Oxford also offer five-day programs. Singularity University offers a ten week Graduate Studies Program every summer which introduces general and technology foresight to entrepreneurs. They also offer and four-day and seven-day Executive Programs several times per year, and a startup accelerator. Draper University is an entrepreneurship training program, started in 2013 by venture capitalist Tim Draper, with a ten-week residential and shorter executive programs, which introduces futures research, ideation methods, and predictive analytics to entrepreneurs, and also offers an accelerator. Six European foresight consultancies, led by Kairos Future in Sweden, offer an International Certified Future Strategist certificate program where students work on foresight consultancy projects as part of their training. The Turku School of Economics in Finland offers a nine day Certified Foresight Professional course. The World Future Society offers master courses during two days prior to their annual conference. The Association of Professional Futurists offers online and traditional professional development seminars. These are all valuable first training options for incoming foresight professionals. Those interested in foresight consulting should also master the skill of case interviewing, one important job interview process used at McKinsey and other consultancies, and at leading companies like Google. In case interviewing, an applicant is given a question, problem, or challenge and asked for advice to improve or resolve the situation, usually a business case that has happened in real life. Good case problems assess general world and business knowledge, ethics, estimation, numerical and verbal reasoning skills, research, communication, empathy, and presentation skills. In short, they discover the applicant’s current ability to produce practical and influential business strategy and rough plans under time constraints—all key competencies of foresight. Case interviewing skills select for folks who might have superior organizational foresight impact, in a very predictable manner. Top consultancies know this, which is why they rely on these interviews as a big part of their selection process, even though they can be a pain to implement. Victor Cheng’s Case Interview Secrets (2012) and his website, Caseinterview.com, are good places to learn more about this very valuable skill. Debating is another skill valuable to good foresight work. In the 18th century US, young men of many walks in life were involved in private debate clubs, in which interesting questions were debated, with responses rated by their peers. The confidential nature of club membership, debates and ratings encouraged each debater to experiment with ways of thinking and arguing, without social cost. Debates ranged across the STEEPS categories (Science: Is Darwin’s theory of evolution correct? Technology: Which tools do our farmers most need? Economy: What trade policy should our state have on imports? Environment: How do we keep our cities clean? Politics: Should there be a voting test? Society: Should prostitution be a crime?). Such topics deal implicityl with the past, present, and future, and debaters use facts, argument, and rhetoric to take positions on complex, uncertain, and often ambiguous topics. When club members are kept cognitively, ethnically, and experience-diverse, with peer-grading of both oral and written debate work, debate is an excellent training ground for foresight professionals. Preparation for a good debate question helps one better understand the world, take a series of positions on social progress, and improve their ability to influence others. For a good primer on debate, see Richard Edwards Competitive Debate (2008). Greg Whiteley’s documentary Resolved (2007) is also noteworthy for highlighting the idiocy of modern rules in academic debate that allow debaters to speak far faster than average (aka speed reading, or “spreading”, at up to 500 words per minute), gaining points with judges but confusing their audiences. The use of word counting software, with penalties for exceeding the professional average of 150 words per minute, would return modern debate to what it should be – a tool for convincing audiences via evidence, argument, and rhetoric. I believe we can look forward to a rule modification to eliminate spreading in the better debate clubs and programs in coming years. In an ideal world, all foresight certification and graduate programs would diagnose the foresight student’s case interview skills prior to admission, and admit and remediate students based in-part on their case interview performance. In addition, continual confidential foresight debates, ranging across all of the STEEPS categories, should also be a central feature of our better foresight training programs. I am hopeful we’ll see such improvements emerge, and the effectiveness of our foresight program graduates continue to improve. Civil life, and our conceptions of the future, are all built around the judicious use of facts, analysis, and argument in social context, for persuasion. Generating influential and adaptive foresight is one of the most complex roles the consultant, manager, or employee plays, second only to adaptive leadership, a related skill we discuss in Chapter 5. Hopefully, our top foresight certification and graduate programs will start distinguishing themselves, and preparing their students for career success, in these and other manners in coming years.